The case we present here is about a 68-year-old woman had an abodominal ultrasonography for nonspecific abdominal pain. It showed a solid lesion in the left kidney. 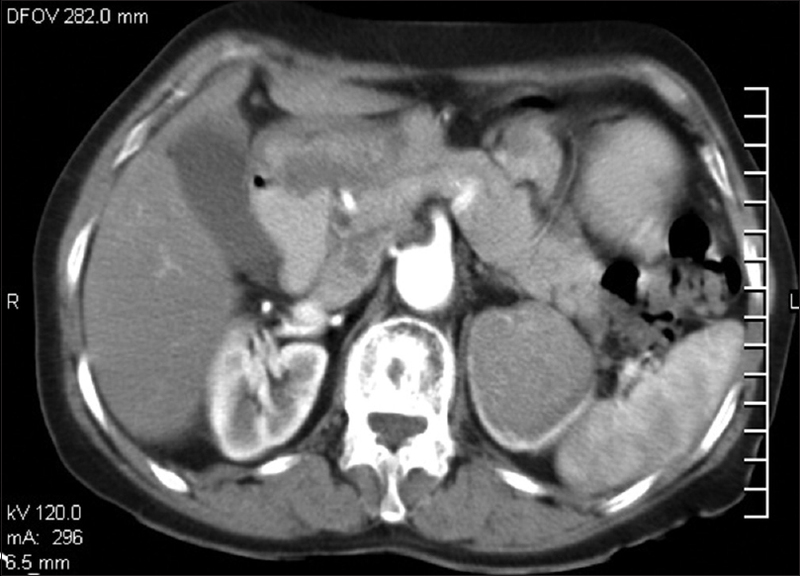 The computed tomography (CT) urogram revealed a well-circumscribed solid lesion in the left kidney [Figure 1]. There was minimal contrast enhancement. There was no renal vein involvement by the tumor or lymphadenopathy. CT chest was normal. She did not have hematuria. Three of her children had undergone treatment for colorectal cancer. Another son of hers and her sister's son had died of lung carcinoma. Her physical examination was unremarkable. She underwent left open radical nephrectomy with a presumptive diagnosis of renal cell carcinoma and made an uneventful recovery. 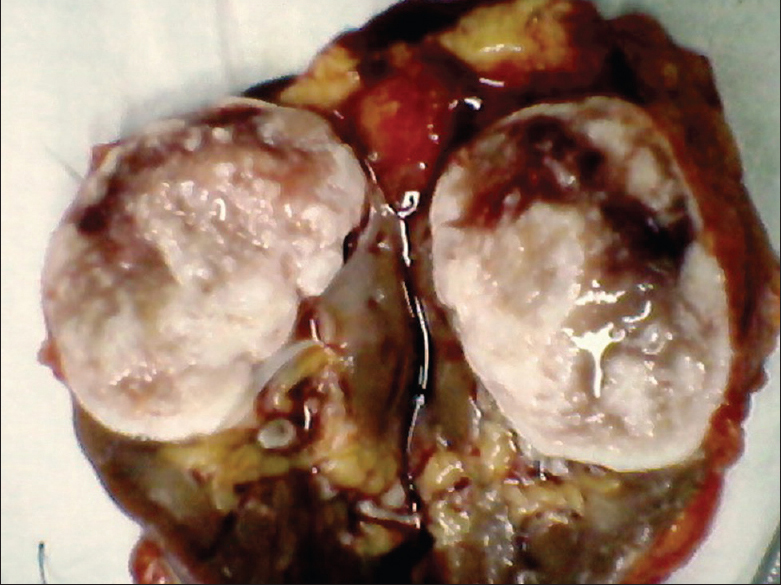 The cut section of the removed left kidney showed a circumscribed, white, firm, and tumor [Figure 2]. The tumor was 4.5 cm in its maximum dimension and confined to the upper pole. There was no capsular or hilar involvement. Microscopically, the mass consisted of spindle cells with hypercellular and hypocellular areas [Figure 3]. The tumor cells contained oval to spindle shaped nuclei and scanty cytoplasm. No significant nuclear atypia or mitoses were seen. There was an area rich in numerous ectatic and interconnecting thin walled blood vessels. Entrapped renal tubules were seen at the periphery of the tumor. Rest of the renal tissue was unremarkable. 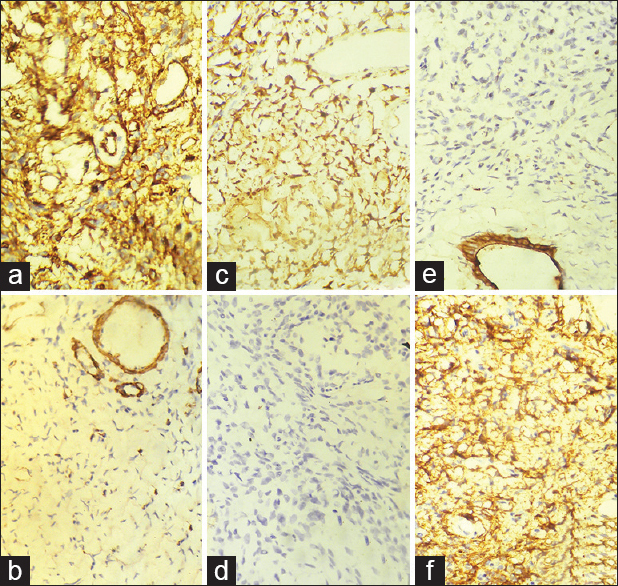 Immunohistochemically, the tumor cells were diffusely positive for CD34 , CD99, and Bcl-2 [Figure 4]. The staining for cytokeratin, α-smooth muscle actin (α-SMA), and desmin were negative. The Ki67(c-kit) index was low (<1%). Based on the histological and immunohistochemical features, a diagnosis of SFT of the kidney was established. Since there were no features of malignancy she was only followed-up. After 6 months she has no evidence of recurrences or metastases. The first case of renal SFT was reported in 1996. Of the renal SFTs reported during the past 10 years, more than 50% have occurred in patients older than 40 years (from 33 to 76 years, with an average age of 52 years). , The male:female ratio is 1:1.5. Most of these tumors were asymptomatic or having nonspecific vague symptoms. Hematuria, the characteristic symptom of renal carcinoma, is rare. Though hemangiopericytoma-like growth pattern is common, episodes of hypoglycemia reported with pleural SFTs are not described with renal SFTs. Within the kidney, SFTs may arise from the renal capsule, cortex, pelvis, or peripelvic connective tissue. In this case, the tumor was in the upper pole adjacent to the capsule. Hence, it could have arisen from the capsule or the cortex of the kidney. Electron microscopy may help in the diagnosis by differentiating tumor cells with fibroblastic features from those with muscular components. However, there are no characteristic features in electron microscopy that will make a conclusive diagnosis of SFT. Surgical removal remains the mainstay of treatment of renal SFTs. Most cases reported so far had undergone radical nephrectomy since differentiation from carcinomas and sarcomas is difficult clinically and radiologically. Clinical behavior of SFTs cannot be accurately predicted on histopathological basis with benign-appearing tumors exhibiting aggressive behavior and vice versa. , Therefore long-term follow-up of these patients is recommended to understand the natural history of renal SFTs better and to identify locoregional recurrences or metastases. Genetic analyses of SFTs have not found consistent and characteristic cytogenetic abnormalities that can be used as an ancillary diagnostic marker. However, occurrence of colorectal and lung cancers in several younger members of the family of this patient raise the possibility of an underlying genetic or familial predisposition. However, it is too premature to make any definitive comments about this until more similar cases are reported. Znati K, Chbani L, El Fatemi H, Harmouch T, Kamaoui I, Tazi F, et al. 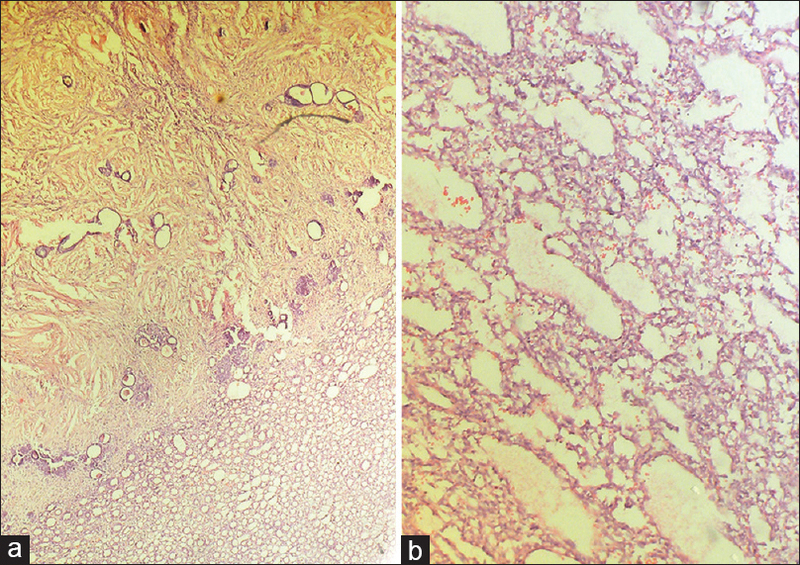 Solitary fibrous tumor of the kidney: A case report and review of the literature. Rev Urol 2007;9:36-40. Park SB, Park YS, Kim JK, Kim MH, Oh YT, Kim KA, et al. Solitary fibrous tumor of the genitourinary tract. AJR Am J Roentgenol 2011;196:W132-7. Sfoungaristos S, Papatheodorou M, Kavouras A, Perimenis P. Solitary fibrous tumor of the kidney with massive retroperitoneal recurrence. A case presentation. Prague Med Rep 2012;113:246-50. Yazaki T, Satoh S, Iizumi T, Umeda T, Yamaguchi Y. Solitary fibrous tumor of renal pelvis. Int J Urol 2001;8:504-8. Hsieh TY, ChangChien YC, Chen WH, Chen SC, Chang LC, Hwang CC, et al. De novo malignant solitary fibrous tumor of the kidney. Diagn Pathol 2011;6:96.